These quiet rear-facing refurbished rooms are designed for the Corporate Executive or Tourists seeking a little extra comfort and accommodate up to two people. The Superior King rooms have a luxurious pillow top chiropractic King-size bed, leather sofa, quiet split system reverse-cycle air-conditioning and a large Smart TV with a selection of Foxtel channels. These quiet rear-facing refurbished rooms are designed for the Corporate Executive or Tourists seeking a little extra comfort and accommodate up to two people. The Superior Queen rooms have a luxurious pillow top chiropractic Queen-size bed, leather sofa, quiet split system reverse-cycle air-conditioning and a large Smart TV with a selection of Foxtel channels. These rooms are designed for the Corporate Executive or Tourists seeking a high level of comfort and accommodate up to two people. The Executive King rooms have a pillow top chiropractic King-size bed, leather sofa, reverse-cycle air-conditioning and a large Smart TV with a selection of Foxtel channels. These rooms are designed for the Corporate Executive or Tourists seeking a high level of comfort and accommodate up to two people. 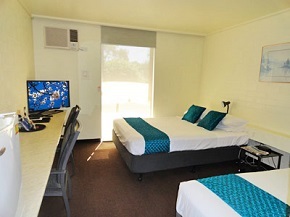 The Superior Queen rooms have a pillow top chiropractic Queen-size bed, leather sofa, reverse-cycle air-conditioning and a large Smart TV with a selection of Foxtel channels. Ideal for small families or corporate travellers wanting to share costs, this room has 1 Queen Bed and 1 Single bed, reverse-cycle air-conditioning and can accommodate up to three people. The room also has a large Smart TV with a selection of Foxtel channels. These rooms are designed for the Corporate Executive or Tourists seeking a little extra comfort and accommodate up to two people. The Executive Queen room has a pillow top chiropractic Queen-size bed, comfortable sofa, reverse-cycle air-conditioning and access to a selection of Foxtel channels. These rooms are designed for the Corporate traveller or Tourist to relax at the end of a long day. These rooms have 1 Double bed and a comfortable Sofa, reverse-cycle air-conditioning and can accommodate up to two people. They also have access to a selection of Foxtel channels. Ideal for small families or corporate travellers wanting to share costs, these rooms have 1 Double Bed and 1 Single bed, reverse-cycle air-conditioning and accommodate up to three people. They also have access to a selection of Foxtel channels. Ideal for larger families or groups wishing to stay together, our more spacious Family room has 1 Double bed and 3 Single beds, has reverse-cycle air-conditioning and can accommodate up to five people. The Family room also has a large Flat-screen TV with access to a selection of Foxtel channels. Designed for the budget-conscious family, this room has 1 Double bed and 2 Bunk Beds, and can accommodate up to four people. Note that age restrictions apply to children sleeping in the upper bunk. This room has reverse-cycle air-conditioning and Free-to-Air TV.